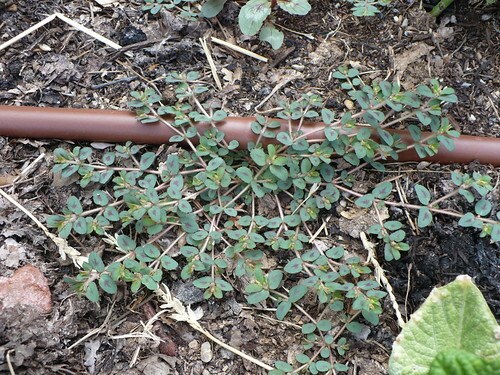 Although the plants in the garden are growing like weeds (the weeds are also growing like weeds, in the interest of full disclosure! ), we are kind of in that post-planting but pre-harvest lull in the garden. We continue to battle the cucumber beetles on the eggplant, and this week we started training the vines to the cattle panel trellises. 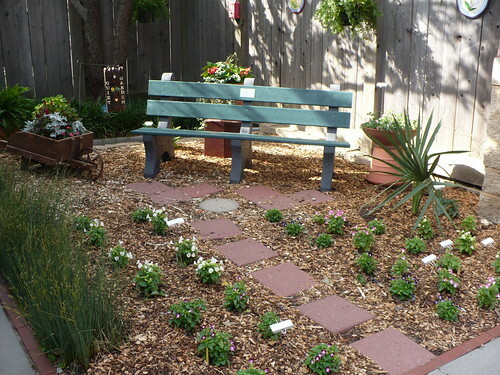 The Quiet Garden area looks so nice after getting everything planted and placed. It will only look better as the flowers continue to grow, fill in, and bloom. I found these two critters on one of the Purple Tomatillo plants. At first glance I thought they were potato bugs, and on second inspection, I wondered about striped cucumber beetles, but they didn’t look right. After consultation with a coworker, he suggested that they were striped blister beetles. UGH! And we thought cucumber beetles were a problem. UPDATE: Then another coworker saw this post and called with the information that it is a Threelined Potato Beetle. Not an insect I commonly see around here, and it is different than the Colorado Potato Beetle. 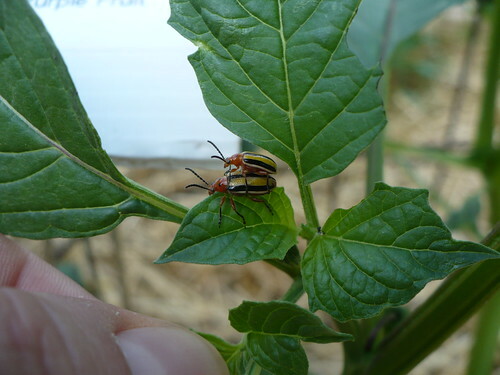 They feed on potato plants, which would explain their presence on the tomatillos (potatoes are cousins). And from the looks of it, they are planning on reproducing and camping out for awhile longer. As you can see, the plants in the Vertical Garden have been growing quickly. The plants on the right side are all different types of cucumbers. On the left side there is a mixture of vining winter squash and melons. The biggest, bushiest plants are the winter squash that are just barely starting to vine. We started clipping the running vines up to the panels today, despite the wind, because they will be humongous by next week at this rate! 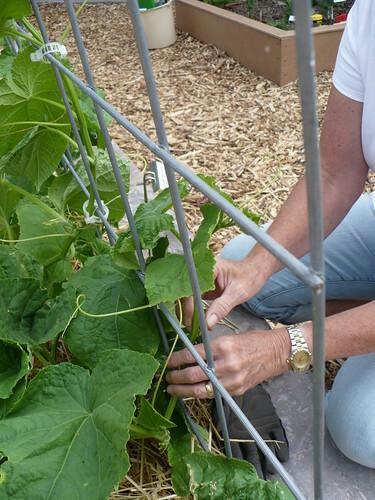 Here you can see one of our Master Gardeners clipping up some of the cucumber vines. They are just long enough to be put up on the trellises, but you can see from the tendrils that they will be doing quite a bit of climbing on their own this week if the wind doesn’t knock them off. 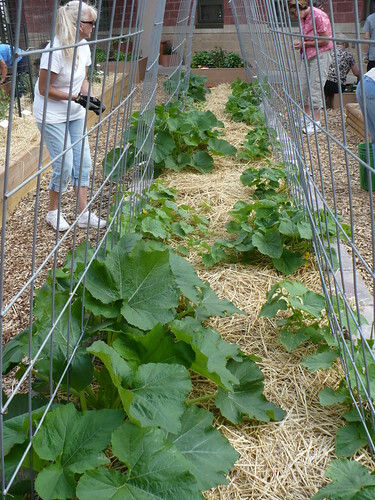 Posted on June 19, 2012, in Working in the Garden and tagged cucumbers, flowers, insects, melons, squash, vertical garden, vines, weeds. Bookmark the permalink. Leave a comment.